In case you haven't noticed, we're rather excited about Song Of The Sea, the forthcoming animated movie from Ireland's Cartoon Saloon. The studio's first feature Secret Of Kells scored an Oscar nomination- and we were rather taken by it too. 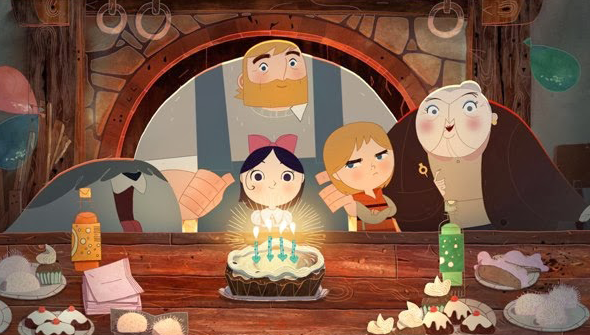 Song Of The Sea will mark Kells co-director Tomm Moore's first solo movie-directing gig. Although due out this year, we'd seen no more than a few stills and a proof-of-concept trailer. Now, however, we get our first proper look at the film as Cartoon Saloon have released the first eagerly-awaited teaser trailer. And what a stunner of a trailer it is. The film, much like the director's earlier film is steeped in Irish folklore- in this case concentrating on the legendary Selkie. It seems to be quite a step up from the earlier film in term of visuals and ambition, while retaining a similarly charming art-style. Just from this short glimpse, you can see this is going to boast some truly beautiful animation and a music score that suits the atmosphere perfectly. There are few higher compliments you can give in the world of animation, but this looks like it will be something like a Gaelic Ghibli. We can't wait to see more. Between this and The Prophet it's been quite a year for Mr. Moore (last seen walking the Cannes Red Carpet with Salma Hayek). A firm release date is still yet to be announced, but you can be sure we'll be keeping an eager eye on this one.